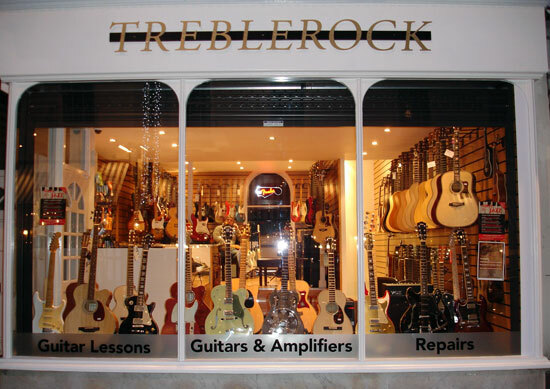 Guitar Shop - Treblerock - New and Used Guitars, Basses and accessories. Treblerock is a guitar shop in Bristol. Located in the heart of Clifton village and is surrounded by lovely little shops, restaurants and bars. Come and visit us in our shop to see our fantastic range of new and used guitars along with a selection of vintage guitars both electric and acoustic. We also offer guitar lessons in our Bristol shop, for more information just give us a call or drop in and see us. Here at Treblerock we do not just sell guitars and amplifiers, we listen to you, talk over your requirements and work with you to provide you a guitar, amplifier or both that is exactly what you want. Using our vast knowledge of guitars, amplifiers and effects we will help you choose the equipment that is right for you and will provide you many years of pleasure. We will even help match amplifiers and effects to your new guitar or existing guitar. Our service extends to aftercare of instruments and equipment, servicing and repair along with tuition and consultancy. The team at Treblerock is headed up by Steve Treble who has been playing guitar since he was a child and has been running Treblerock since 1991. Steve has an expert knowledge of all things musical and can help you choose the setup you need to suit your style and requirements. The setup and configuration of your equipment will impact on your performance and so to this end Steve offers all customers the information they need to setup their amplifiers and instruments to achieve the desired sound. Steve Treble offers personal tuition located in the Bristol shop for Guitar and Ukulele and even offers tuition in guitar and amplifier setup. For more information please call into the shop located in Clifton, Bristol. Or you are welcome to call or email.